BACKGROUND: Although blood ordering is a common practice in surgical field, in obstetric patients too requests are commonly made to crossmatch units of blood for patients in whom bleeding is anticipated and to provide precautionary cover for cesarean section. This was a prospective study on blood requisition and utilization practice among obstetric patients at our center. METHODS: Data collection pro forma was used to collect information from antenatal case notes on demographics, transfusion request, units transfused, reason for transfusion, and related laboratory data. 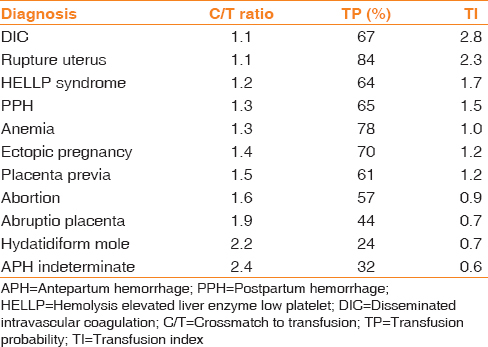 Blood utilization was calculated using crossmatch to transfusion ratio (C/T), transfusion probability (%T), and transfusion index (TI) indices for all obstetric conditions. The maximum blood ordering schedule (MBOS) was used to develop algorithm for obstetric conditions. RESULTS: The incidence of red blood cells transfusion among all obstetric admissions was 708 out of 17275 (4.1%). Only 18% of blood requested for obstetric patients actually received transfusion. The overall C/T ratio, transfusion probability, and TI in obstetric patients during the study were 3.5%, 19.3%, 0.35%, respectively. Transfusion algorithm by classifying all obstetric conditions into three categories was developed based on MBOS for obstetric indications at our center. CONCLUSION: Although blood was reserved for the most obstetric patients, majority of the patient did not require transfusion. Hence, a new blood reservation and pretransfusion policy were recommended to minimize overordering and needless operating expenses for blood banks. Obstetric conditions associated with the need for blood transfusion may lead to morbidity if not managed correctly. The hemorrhage is often sudden, unexpected and encompasses antepartum, intrapartum, and postpartum bleeding. The administration of red cell transfusions during pregnancy and in the peripartum period is not uncommon, occurring in 2%–3% of all pregnancies., The estimated average blood loss among vaginal and caesarian deliveries are between 300–500 ml and 900–1100 ml, respectively., The increased blood volume associated with normal pregnancy typically accommodates obligatory blood loss that occurs during vaginal or cesarean delivery. In obstetric practice, requests are commonly made to crossmatch units of blood for patients in whom bleeding is anticipated and to provide precautionary cover for cesarean section. Surgical guidelines state that the number of blood unit crossmatched before the operation should meet the intraoperative transfusion requirements in more than 90% of the patients. Crossmatch of donor units, which are unlikely to be used for transfusions, is said to be an inefficient manner of utilization of blood bank services. This preoperative over-ordering of blood has been documented since 1973. Subsequently, a number of studies showed over ordering of blood in most of the countries. Such over-ordering also contributes to needless operating expenses for blood banks. In our center, obstetricians usually request for a minimum of two units of cross-matched blood for cases of cesarean section or patient in labor irrespective of the hemoglobin. Most of these cross-matched pints of blood are never used. The blood gets tied down and is unavailable for other users. Unnecessary blood reservation, apart from the consideration of cost, may result inapparent blood scarcity especially in facilities where blood is in short supply. This then denies those patients who really need blood for life-saving interventions. Auditing and reorganization of blood ordering practices have been effective in decreasing the initial high crossmatch to transfusion (C/T) ratio. Therefore, it is necessary to streamline blood ordering and transfusion practices in obstetrics at our center. Continuous monitoring of transfusion activity as well as implementation and optimization of transfusion strategies may help to improve transfusion practice. This was a prospective study conducted in tertiary care obstetric center in South India. The study analyzed transfusion request forms of obstetric patients, for whom transfusion was given for a 1-year period from October 2010 to September 2011. The blood bank used citrate phosphate dextrose-adenine bags to collects blood from both voluntary and family donors. Only blood components were used in the present study. Clinical details were recorded in pro forma from the request form submitted and maternal case record. These included patient demographics, provisional diagnosis (e.g., abortion, postpartum hemorrhage [PPH], hemolysis elevated liver enzyme low platelet count [HELLP], and disseminated intravascular coagulation [DIC]), and blood requirements were recorded. The standard procedure for crossmatch protocol includes, patient blood group and crossmatch with the same group was followed during the study. The requests and patients were classified according to their diagnosis. Under each diagnosis, the numbers of patients and units of red cells requested and transfused were recorded. Transfusion index (TI) = No. of units transfused/No. of patients crossmatched. This is the average number of units transfused for a given procedure. A transfusion of more than 0.5 is taken as an indication that blood needs to be crossmatched preoperatively for the procedure. Using these blood utilization indices data, the aim was to develop new pretransfusion algorithm policy for all obstetric conditions at our center. The data were analyzed utilizing Microsoft Excel for tabular transformation and graphical representation. GraphPad Instat Version 3.0, GraphPad Software, San Diego, CA was used for statistical analysis. For comparing the proportions between various groups and parameters Chi-square test with Fisher's exact test was used. During the study, there were 17275 obstetric admissions, which included 15191 deliveries, 325 abortions, 77 ectopic pregnancies, 49 molar pregnancies, and 1633 admissions for other obstetric reasons. 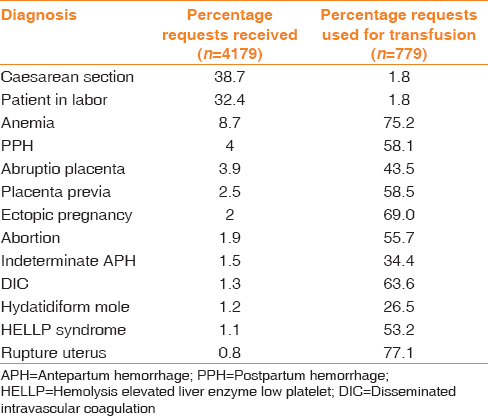 A total of 3675 patients (21.3% of all obstetric admissions) had requests for red cell transfusion. Of these 708 patients (19.3%) received transfusion. The incidence of red cell transfusion among all obstetric admissions was 4.1% during the study. Of the 4179 requests for red cell transfusion, for 3400 requests (81.4%) blood was not transfused and for 779 requests (18.6%) blood was transfused. [Table 1] shows the distribution of red cell transfusion requests with respect to individual diagnosis and the number actually transfused for each conditions. Among the 2606 patients for whom a request was received as cover for labor or cesarean section, only 2.1% patients required transfusion. This comprised of 0.9% patients who were in labor and 1.1% of patients who were posted for cesarean section. [Table 2] and [Table 3] show the actual number of red cell units that were crossmatched and transfused for various obstetric conditions. A total of 4618 units of red cells were crossmatched, out of which 1302 units were transfused. The overall C/T ratio, transfusion probability, and TI during the study were 3.5%, 19.3%, 0.35%, respectively. This high C/T ratio was due to high number of crossmatch requested for patients in labor and cesarean section. All three indices were significant and in acceptable range in patients with DIC, rupture uterus, and HELLP syndrome, showing that blood was ordered and used optimally, as indicated by their transfusion indices with C/T ratio <2.5, %T >30, and TI >0.5. A similar pattern of blood usage was observed in ectopic pregnancy, placenta previa, anemia, abortion, abruptio placenta, and indeterminate antepartum hemorrhage (APH). The basic assumption behind any order for crossmatching of blood is that the patient needs or has a reasonable possibility of requiring blood transfusion. In addition, to this, the practice of ordering was probably because of the uncertainty if blood will not be available if needed. This ordering of blood is often dictated by habit and may be wasteful of personnel time, reagents and outdated units of blood. Overall cost and workload increases on the transfusion service. The efficient use of blood and blood components remains a challenge to those involved in transfusion therapy. Over-ordering is usually defined as a problem, when preoperative blood orders exceed, on an average, twice the actual consumption. Preoperative over ordering has been documented since 1973 when Friedman published their findings. One of the standard methods of determining the efficiency of blood ordering is to determine the C/T ratio. This index is commonly used for assessing blood utilization in elective surgical patients. Earlier studies used this ratio in obstetric patients undergoing surgical intervention such as cesarean section, laparotomy, and dilatation and curettage. In the present study, these ratios were used to calculate the overall indices for all obstetric diagnosis. The overall C/T ratio for obstetric conditions ranged between 2.9 and 5.4 in previous studies., Kamani et al. suggested a C/T ratio of 3–3.5 could be achievable for high-risk obstetric institutions. In our hospital, a routine ordering has evolved overall C/T ratio of 3.5. Transfusion probability acts as a good indicator of optimum blood usage. Transfusion probability of < % implies blood ordered for some diagnoses was used only for a small proportion of patients. In the present study, the overall transfusion probability was 19.3%. The transfusion probability in cesarian section was 1.9% and was too low when compared to 9.3% from a study by Penney et al. TI is blood requirement for a particular procedure. In the present study, TI was calculated for each obstetric diagnosis. The maximum number of units transfused for each diagnosis indicates the severity of bleeding in each condition and is also a useful guide to decide whether crossmatched blood needs to be kept in reserve for patients with those disorders, where the C/T ratio is relatively low. The overall TI in the study was low (0.35) due to more crossmatches done for patients in labor and cesarean section. TI was maximum for patients with DIC (2.8) [Table 3]. From these data, we observe that review in our transfusion request protocol is necessary for patients with obstetric indications. The lack of proper guideline with regard to blood ordering and lack of education of physicians on blood ordering are two important areas, which contributed to excessive crossmatching. One way of dealing with over-ordering is to employ a “maximum blood ordering schedule” (MBOS) for procedures with a C/T ratio of <2.5. Mead et al. suggested that the MBOS should not exceed 1.5 times the mean number of units given per transfused patient for that procedure. Based on this, we have suggested an MBOS in our institute for obstetric patients who had shown significant blood utilization [Table 4]. Currently, very few centers in India had adopted routine blood type and screen (T and S) testing for pregnant patients admitted in labor before either vaginal or cesarean delivery. Studies have clearly demonstrated that the type and screen procedure is a safe, effective, and cost-efficient method to avoid unnecessary crossmatching for routine procedures. Based on our study results, an algorithm was developed using transfusion probability for each obstetric diagnosis for our study. We grouped all obstetric conditions into Category I, Category II, and Category III. In patients in whom antibody screen becomes positive, crossmatch shall be done prior for all category patients based on MBOS. The study concludes only small proportion of obstetric patients require blood transfusion and much time and effort as well as resources are wasted in unnecessary crossmatching. By adopting MBOS for obstetric practice, the excess blood ordering can be minimized and should be reviewed regularly. Klapholz H. Blood transfusion in contemporary obstetric practice. Obstet Gynecol 1990;75:940-3. Silverman JA, Barrett J, Callum JL. The appropriateness of red blood cell transfusions in the peripartum patient. Obstet Gynecol 2004;104:1000-4. Newton M, Mosey LM, Egli GE, Gifford WB, Hull CT. Blood loss during and immediately after delivery. Obstet Gynecol 1961;17:9-18. Goundan A, Kalra JK, Raveendran A, Bagga R, Aggarwal N. Descriptive study of blood transfusion practices in women undergoing cesarean delivery. J Obstet Gynaecol Res 2011;37:1277-82. McFarland JG. Perioperative blood transfusions: Indications and options. Chest 1999;115:113S-21S. Kamani AA, McMorland GH, Wadsworth LD. Utilization of red blood cell transfusion in an obstetric setting. Am J Obstet Gynecol 1988;159:1177-81. Friedman E. Programs educate physicians on costs, use of blood. Hosp Med Staff 1980;9:2-9. Rouault C, Gruenhagen J. Reorganization of blood ordering practices. Transfusion 1978;18:448-53. Vibhute M, Kamath SK, Shetty A. Blood utilisation in elective general surgery cases: Requirements, ordering and transfusion practices. J Postgrad Med 2000;46:13-7. Penney GC, Moores HM, Boulton FE. Development of a rational blood-ordering policy for obstetrics and gynaecology. Br J Obstet Gynaecol 1982;89:100-5. Goodnough LT, Daniels K, Wong AE, Viele M, Fontaine MF, Butwick AJ. How we treat: Transfusion medicine support of obstetric services. Transfusion 2011;51:2540-8.